Nicola Sturgeon should spell out her plans for a second independence referendum, the Scottish Greens have claimed. Party co-convener Patrick Harvie said there is a majority of MSPs in Holyrood who back independence. But he was concerned waiting for Brexit to be finalised might see the pro-Yes side miss this "window of opportunity" for a second independence referendum. The Glasgow MSP also hit out at Labour over Brexit. 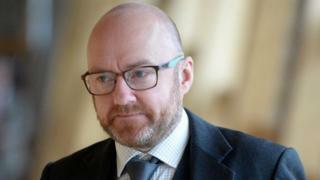 Speaking in an interview with BBC Scotland at the Scottish Greens conference in Edinburgh, Mr Harvie said: "I understand why some in the SNP want to wait for clarity on Brexit before they decide on the timing of the independence question in the future. "The trouble is that clarity may not be coming around the corner. If there's an extension even of months, possibly longer, then that clarity won't be emerging, and we may miss the window of opportunity in this session of the Scottish Parliament. "I don't want to see that opportunity missed, and the reality is there has already been a material change of circumstances in Scotland. He added: "I think we very clearly do need some clarity from the Scottish Government about what's going to happen with the timing of an independence referendum. We need to have the time to pass legislation through the Scottish Parliament to ensure that that'll happen, and we have a majority for that at the moment. "But we also need in principle a clear defence of the fact that Scotland has the right to make this decision." In January, Nicola Sturgeon pledged to set out her plans for a second independence referendum "in the coming weeks" - even if the Brexit deadline is extended. And then last month, in response to a Holyrood question from Mr Harvie on the timing of any second poll, the first minister said: "I think it is reasonable to wait to see what clarity emerges in the next few days, even if I suspect it will just be clarity that there will be no clarity - and then I will set out my views on the path forward". Asked about the timing delay yesterday, Ms Sturgeon said it was because there was "still no clarity in the immediate term about which path the UK is going to take", and added: " I had hoped that we would be at that point by now, but unfortunately I underestimated the incompetence of the UK government". He said the party should not "take up this absurd offer of sharing the blame for Brexit" and claimed the Scottish Parliament had been "cut out and ignored" during the Brexit process. He said: "I think we need to give a very clear message to the Labour Party. "Do not take up this absurd offer of sharing the blame for Brexit, do not trust a word you hear from a Tory party that doesn't even know who its next leader will be, do not expect to be forgiven if you facilitate this hard right Brexit project. "We have been cut out and ignored by the UK government at every turn. Every single offer of compromise has been rejected." The Scottish Green's co-convener, Maggie Chapman also addressed the two-day conference, praising the campaigning efforts of young people who walked out of school to demand action on climate change. She said: "I want to congratulate and praise the thousands of school climate strikers who walked out of classes on 15 March. We can stop climate breakdown and we can make that movement a force that doesn't just save the planet, but one that creates a better world for all."